A+ is a basic level course on computers. The course aims to give a basic understanding of computers for beginners and novices. Being vendor neutral, A+ course prepares students to work with different products from different manufacturers. The main objective of the course is to cover the topics and objectives that are essential for CompTIA certification. 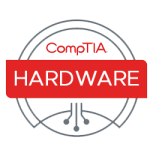 The course is dedicated to providing students with the in-depth knowledge and experience required for a student to complete a CompTIA certification. Techradix believes in classroom-led training for better understanding. The A+ forms a part of Techradix’s IMS course structure which provides an overview of the basic understanding of how computers work. A+ is considered as the first step to learn the unique IMS Stack of Techradix. Today’s industry is skill based, and recruiters are looking for the professionals with multiple skills, and our course structure covers skills that are much required for employ-ability. Mobile security & data syn.